If you’re using a Chromium based web browser in Ubuntu, you may find that the Adobe Flash Player installed from Ubuntu Software Center does not work all the time. 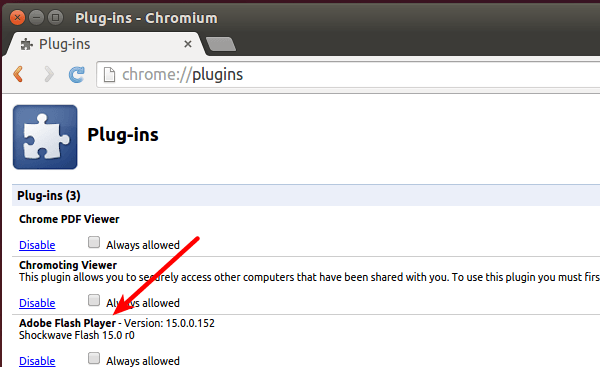 Because ‘Aura’ for Linux, which replaces GTK+, lacks coded support for NPAPI plugins, the “old” Adobe plugin in Ubuntu repositories does no longer play Flash content in Chromium based web browser. As a workaround, you can use the ‘Pepper Flash’ which is bundled with Google Chrome that provides the latest Adobe Flash Player for Linux. This will install the package “Pepperflashplugin-nonfree“, which will download Chrome from Google, unpack it and make the included Pepper Flash Player available for use with Chromium. Hi, would this also work for the new Opera Beta for Linux? I like using this browser, but no flash is an issue. It works! Tested in Opera developer 26 in 64-bit Ubuntu 14.10 Beta 2. Connecting to dl.google.com (dl.google.com)|74.125.134.91|:80… connected. I need help, no one seems to know how to fix it!